On Saturday, June 16, 525 runners and walkers joined the Randolph Education Foundation (REF), in its ninth annual Randolph Rocks 5K. The event raised $25,000 and had support from more than 45 volunteers and 40 businesses and local merchants. Collin Frost of Randolph took first place overall, completing the 5 kilometers in 16:21 minutes. Rebecca Crawford, also of Randolph, finished in 19:49, obtaining the first place overall for women. Awards were presented in more than a dozen categories, including top male and female Randolph teacher or staff member, which went to Nicholas Albanito, health and physical education teacher at Randolph High School with a time of 19:44; and Dawn Melody, first-grade teacher at Fernbrook School, with a time of 23:49. The awards for top male and female Randolph residents also went to Frost and Crawford. 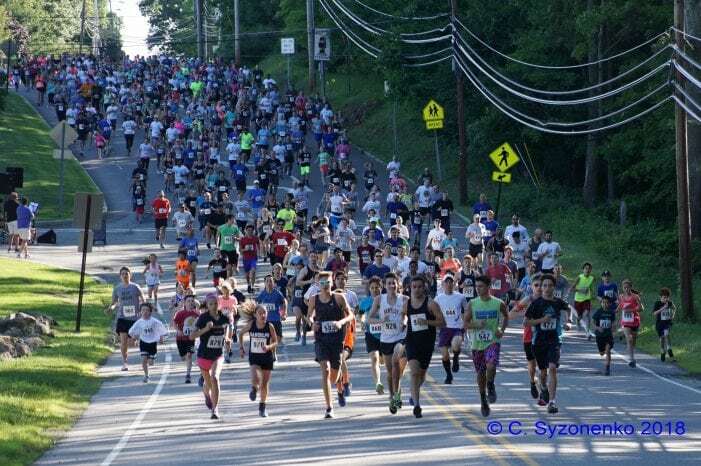 Since 2010, the REF has organized the annual 5K as an effort to bring the community together to raise funds in support of initiatives that promote innovation, creativity, school readiness and well being in the Randolph schools. A team of more than 45 volunteers, including RHS students led by Sue Adler, managed registration tables, kept runners on course as they wound their way through roads, trails and track, and served up refreshments and water during and after the run. Township leadership, board of education members, and school administrators were also active participants in the race. Mayor Mark Forstenhausler welcomed runners at the start line and signaled the start of the race. Board of Education President Ronald Conti, Vice-President Joe Faraneta, and Superintendent Jennifer A. Fano joined the runners and walkers through the entire 5 kilometer course. Participants also enjoyed the display of talent from several musicians, most of them current Randolph students. Senior Gabriela Toledo once again delighted the crowd with her rendition of the National Anthem at the start line. She then joined her band mate, Matt Sukert, to provide live music along the way to motivate the runners and walkers. Christopher Smith, and eighth-graders Dan Goldberg and Ryan Borinski of Drum and Drummer, rounded out the headliners for the day. Luke Scanzera, a current student at RHS, served as the DJ at the race start and finish lines. More than 40 businesses and local merchants contributed to the success of the event. The warm-up was led by enthusiastic trainers from Next Generation Training Center in Randolph, and a vendor fair at the finish line included a whole host of businesses. Numerous door prizes donated by local businesses were given away at the race. The grand prize, a Trek Marlin 6 Mountain Bike from Marty’s Reliable Cycle, was won by Kiersten Drazek, a seventh-grader at Randolph Middle School.